Endodontists are dentists with special training in endodontic procedures. Because they limit their practices to endodontics, they treat these types of problems every day. They use their special training and experience in treating difficult cases, such as teeth with narrow or blocked canals, or unusual anatomy. To become specialists, they complete dental school and a minimum of 2 years of extra postgraduate advanced training in endodontics. 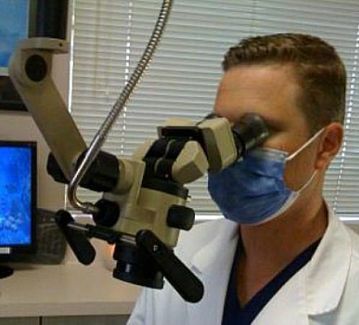 They perform routine as well as difficult and very complex endodontic procedures, including endodontic surgery. Endodontists are also experienced at finding the cause of oral and facial pain that has been difficult to diagnose. In our office, we use advanced technology, such as operating microscopes, ultrasonics and digital imaging, to perform these special services. If your General Dentist suggests extracting your tooth, ask if it can be saved with an endodontic procedure, also known as root canal treatment. Endodontists can often save the most severely injured teeth. Endodontic treatment removes the injured or inflamed pulp (soft inner tissue), carefully cleans and shapes the inside of the tooth, then fills and seals the space. After your endodontic treatment, usually within 30 days, it is necessary that your tooth is restored by your general dentist. After your tooth is restored, it then continues to function like any other tooth. We will provide a thorough diagnosis, explain different treatment options to you, and the likelihood of success for each, with the hope of providing you with enough information to enable you to make an informed choice. Saving your natural tooth should always be your first choice when dental care is needed. Do everything possible to save your teeth.